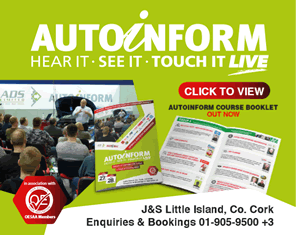 Autobiz is a trade-only subscription magazine and website for the Irish motor trade. We provide the only monthly magazine for the trade. Autobiz also incorporates Trade2Trade, a trade-only car sales service. Log on to Trade2Trade.ie for more details. Autobiz magazine is published 10 times a year. The publication, formerly Crashed Cars Monthly, is now in its 41st year, and is distributed to over 5,300 motor traders in the Republic. Annual subscription of €85 includes delivery of the monthly magazine, up to 5 free car part entries per month (thereafter €3.00 each), and access to Autobiz.ie. This website provides trade news and unlimited access and search capability on car parts for subscribers, who are registered with us and have been issued a username & password. Autobiz has unrivalled penetration of the Irish motor trade. We offer full colour and black & white display advertising. We also offer a leaflet distribution service. The magazine is packed full of interesting trade news and articles that relate to our motor trade customers. The listing of used parts and trade cars for sale is compiled from information pooled by subscribers, and published in the magazine each month. The car makes and models are listed alphabetically, in year order, with the final column showing the location by county. We enjoy substantial repeat business from our advertisers, based on the good response they receive from advertising. Autobiz magazine is issued free to some non-subscribers as a service to our display advertisers, with an abridged version of the phone index.